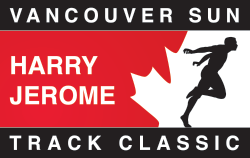 On Feb 2nd, it's the 2019 edition of the Harry Jerome Indoor Games. The Indoor Games is an exciting event held each year that provides an opportunity for track athletes of all ages to participate. This is the ninth year that this event offers the opportunity to compete on the indoor track and field complex at the Richmond Olympic Oval. The facility accommodates a level, 5-level, 200 metre oval running track plus room for shot put and high jump. In addition, a separate 100m straightaway offers a safe, 5-lane environment for up to 60m sprints and 60m hurdles events. NOTE: The Richmond Oval parking spaces can be limited. Please allow additional time to secure parking. JD (Born 2010-2009-2008-2007-2006), U16 (Born 2005-2004), U18 (Born 2003-2002), Masters & Open Divisions (Men & Women).